Walter Hill’s action-packed eighties cult favourite Streets Of Fire finally makes its Blu-ray bow with a brand new transfer and some neat special features from Second Sight Films. This highly stylised rock and roll fable was a critical flop on its cinema release back in 1984, but has since built up something of a cult following, and with its back drop of rain drenched, neon-lit streets is one of the most visually iconic films of the decade. It features a memorable cast that includes Michael Paré (The Virgin Suicides, The Philadelphia Experiment and the favourite leading man of one Uwe Boll), Diane Lane (Man Of Steel, The Perfect Storm), Willem Defoe (Spider-Man, Antichrist), Rick Moranis (Ghostbusters, Honey I Shrunk The Kids), Amy Madigan (Field of Dreams, Uncle Buck), Deborah Van Valkenburgh (Hill's The Warriors) and Bill Paxton (oh come on, you all know at least one Bill Paxton film), and comes to Blu-ray for the first time with a stunning new transfer and featuring new bonus features in November 2013. Big time rock singer Ellen Aim (Lane) is playing a gig in her hometown when a local bike gang The Bombers, led by the menacing Raven (Defoe), storm the stage and kidnap her. Tom Cody (Paré), a tough ex-soldier and Ellen’s ex-boyfriend returns home to get her back and he’s ready to take on the whole gang. 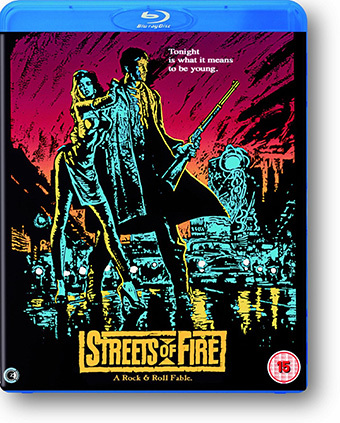 Streets of Fire will make its UK Blu-ray debut on 18th November 2013 from Second Sight at the RRP of £17.99.